WordPress, launched in 2003, is the most used online content publishing platform, that powers millions of websites around the web. As per the latest report from W3Techs, WordPress is used by 22% of all websites. WordPress is available in two versions: the fully hosted WordPress.com and the self-hosted WordPress.org. To understand the difference between them, check this infographic. In our modern digital world, where we have numerous browsers, resolutions and devices; it’s a necessity – that a website is accessible, available, and fast loading everywhere. We follow below mentioned process for psd to wordpress conversion and based on it, we have successfully delivered thousands of wordpress themes. Let’s have a look at our infographic! Are you ready to move to WordPress? If yes, avail this service at an affordable price. What is Wordpress? WordPress, started in 2003, is an open-source CMS (Content Management System) based on PHP and MySQL. It is the most popular CMS in use today powering more than 22.0% of all the websites on the web. 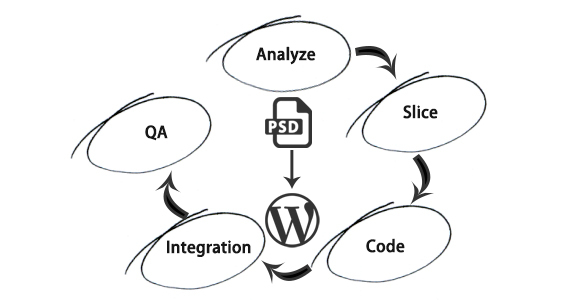 Key features include a plug-in architecture and a web template system. WordPress: WordPress is used by 59.8% of all the websites whose CMS we know. Joomla: Joomla, with 8.4% market share, is the second most used CMS after WordPress. Drupal: Drupal, with 5.2% market share, holds the third position in the CMS usage statistics. Others: Other CMSes - like Blogger, TYPO3, Concrete5 etc. - are used by 26.6% of all the websites. % of websites using various versions of WordPress..
Why to Switch to WordPress?. Step1: The first and foremost step is to examine requirements and the design..
Step2: At this stage, slice the design and export images to preferable format..
Step3: Write HTML/CSS code and test it on various browsers, OS and on devices..
Step4: Integration of html/css into wordpress, widget setup, plugin installation..
Step5: Testing- run multiple tests like browser testing, w3c validation, link validation, responsive testing. As of May 1, 2014, version 3.9 (Smith) that was released on April 16, 2014 had been downloaded more than 7 million times.